As part of her ongoing training series, Art of Coaching fitness editor Marie Zidek demonstrates 6 agility drills here designed to increase quickness and overall mobility. Zidek, an assistant coach at the University of San Diego and a certified strength and conditioning specialist, stresses that these drills go beyond just fitness training by helping athletes develop better spacial awareness, a key to efficient movement during a volleyball match. This is an ideal training exercise for helping players make quicker direction changes. It's particularly useful for movements that have to be made when a ball is deflected or comes off a blocker's hands. The exercise Marie introduces here involves jumping back and forth laterally over a row of cones: 3 cones for younger athletes, 5 or more for older athletes who have been playing volleyball longer. This is a good injury prevention exercise because it trains the body to land from jumps in a controlled manner. The agility exercise here involves changes of direction, from forward sprints to lateral shuffles. This is a good strength builder for the many quick moves players have to make in volleyball. Appropriately named, the T Drill requires athletes to sprint a course shaped like a "T". The example here is a mix of forward sprints and shuffles, but as Marie points out, coaches can be creative and include any number of volleyball-like moves. The purposes of this drill are to work on smooth changes of direction, quick starts and stops and spacial awareness that allows players to stay focused on the game. Similar to the "T Drill," the "Y Drill" builds strength and agility for quick direction changes and helps athletes develop spacial awareness. In this drill, 4 cones are placed to form a square, and the athlete moves quickly from the middle of the square to each cone and back. Variations include having a coach point to the cone where the athlete should go next. 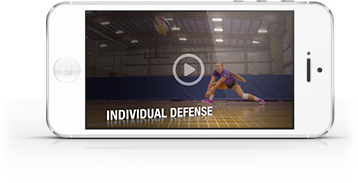 This adds an extra challenge and simulates a volleyball play by requiring the player to make head-up movements and focus on something besides footwork.